Oasia Residence is a serviced apartment in Singapore that offers 140 studios and apartments (one and two bedrooms) for longer-staying guests (minimum of 7 nights) who are looking for a home away from home experience. It is located along West Coast Crescent. We were supposed to stay 11 nights, but due to certain circumstances we had to extend an additional 3 nights at the very last moment. Thankfully Oasia Residence was able to accommodate us in the same apartment at the same rate. The team handling the extension process were professional and super helpful. It did help that the front desk team was all smiles and very accommodating too. Never have we felt more at home than at Oasia Residence, where the team makes it a point to smile (warmly) and greet guests whenever they have the time. The puppy was so smitten with them that he had to take a double look when we walk past the reception area just to get acknowledged by them (what can I say he loves the attention). Kudos to the team! The cool thing about Oasia Residence is that guests can also utilize the facilities of its affiliated Seahill Condominium next door (e.g. swimming pools and BBQ pits). So if the pool located on the seventh floor at Osasia Residence is too small and quiet for you, you could always try out the bigger one "next door" on the ground level. Do note that the pools are a mere 1.2 meters in depth, but it is sufficient for a swim. There is a small 24/7 gymnasium located on the seventh floor, right next to the swimming pool. While it might not be that big and able to substitute for a full-size gym, it is still quite equipped for working out those major muscle groups, or simply burning the calories away. The steam room / sauna are also located on this floor. Want something more exciting? Guests at Osaia Residence can utilize the tennis court located on the rooftop; enjoying a game with a view. While usage is free, in order to use the tennis court guests would have to make a booking. The Living Room, is a dining area for guests to lounge about in a wide comfy space with plenty of daylight pouring through the floor-to-ceiling glass windows. Breakfast is also served here during weekday mornings. Oasia Residence welcomes guests to help themselves to the refreshments which are available 24/7. Coffee/tea, fruit-infused water, fresh fruits etc… something we helped ourselves to when we were there (the fruit-infused water was a nice change from having to boil your own water). Relatively new (about a year or so old), so the furnishings are still in pristine condition. Cleaning is done thrice weekly (Great World Service Apartments does theirs twice weekly). Perfect for those who have pets, as it is pet-friendly. Do note that there is a pet levy. Simple but adequate breakfast is provided on weekdays (sans public holidays). Able to use the facilities (e.g. pool, bbq facilities etc...) of the condominium next door. Kitchen is fully equipped with utensils to make your own meals. Complimentary shuttle service to send residents to the nearest MRT Stations (e.g. Clementi and Haw Par Villa). Sheng Siong supermart is a 10 minute walk and West Coast Plaza within a 15 minutes walk away to get all your groceries to make your own meal. There are places to eat (e.g. coffee shops, hawker centers, restaurants) nearby as well, all within a 10-20 minute walk away from Oasia Residence. 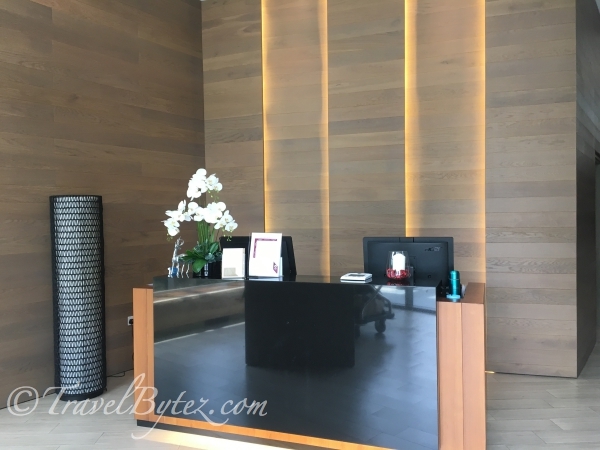 Service was impeccable and very warm: warm smiles and the love to be around people can be felt from the front desk desk, even housekeeping were polite and amicable. Quite secluded and located in a “quiet” part of Singapore. Not very near any MRT Stations (not very walk-able). Not that many food options, but it is adequate. Perfect for those who are looking for something less touristy and getting a more local nature experience in a different part of Singapore. The smartphone that Oasia Residence provides comes in handy when you are out exploring; saving money that would have been spent on renting a SIM Card or pocket WiFi device. Not only does it provide you with data, the smartphone is equipped with apps that will let you know the latest things to do or see (e.g. festivals, carnivals, discounts etc...); perfect for itinerary on the go. In addition, you would also be able to make "free" local calls and selected countries on the smartphone; truly a handy phone. Last but not least, the price is also comparable to staying in a hotel; there is more space and you save with the handy phone. You also get to save more money by whipping up your own meals too. For those wanting a staycation, especially with your pets (no more than 30kg), Oasia Residence is highly recommended if you are looking for a place to rest and relax. It is very hard to find an accommodation that accepts larger pets in Singapore. Most of the establishments in Singapore are biased towards the smaller breeds or none at all. The puppy enjoyed his time so much that he almost did not want to go home: the long walks, the parks and the friendly staff who greeted him (yes the dog) made him feel like a special puppy. Do note that dogs are only allowed to take the service lift and are not allowed in the common areas such as the pools and recreation / breakfast areas (basically they can only be in the room or outside the property to explore and walk). If you want to be right in the middle of all the attractions or nearer to the main tourist attractions, than the location might not be so ideal. Also if you are allergic or dislike animals, you may wish to consider staying elsewhere. While a serviced residence does not have the same level of attentiveness from a hotel, it provides more privacy and is more economical for those looking for a longer stay in Singapore. In addition, with the opportunity to benefit from the facilities over at Seahill Condominium, guests of Oasia Residence will be able to hold BBQ dinners and parties whenever they want. It’s location, although a little out of the way and a distance from town, provides a soothing and relaxing sanctuary; a home away from home. Regular shuttle buses run from the property to connect residents to nearby MRT stations like Clementi and Haw Par Villa, making it easier and more affordable to visit Singapore and places of interest via the MRT system. Moreover, it certainly is an added bonus when the staff working at Oasia Residence enjoy their work and are all smiles whenever they greet guests; they are people-orientated and service was excellent. Do take note that all rooms are subjected to a minimum of SEVEN nights’ booking. Depending on whether you have a pet, if you do it might be better to email for a quote instead. Who knows? They may be having a promotion. Korean Air: Seoul here we come!